My mom and I made these cherry kuchen bars last week (yes, it was a joint effort!) after finding the recipe in a holiday baking edition of Better Homes and Gardens. 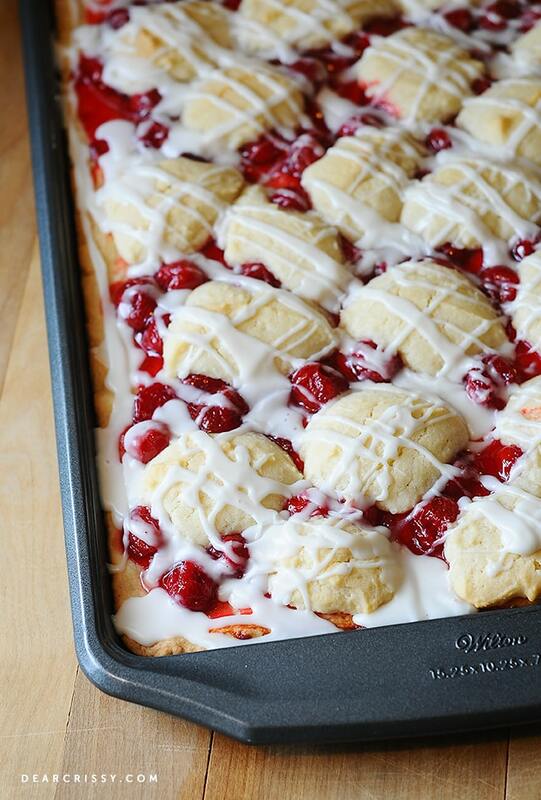 You may have seen this recipe referred to as cherry pie bars on other blogs or on Pinterest. Yep, it’s probably the same delicious recipe! When I think of cherries, I’m transported to my childhood. My grandpa was a huge fan of cherry pies, in fact, I’m pretty sure he almost always had a half-eaten cherry pie in his kitchen! 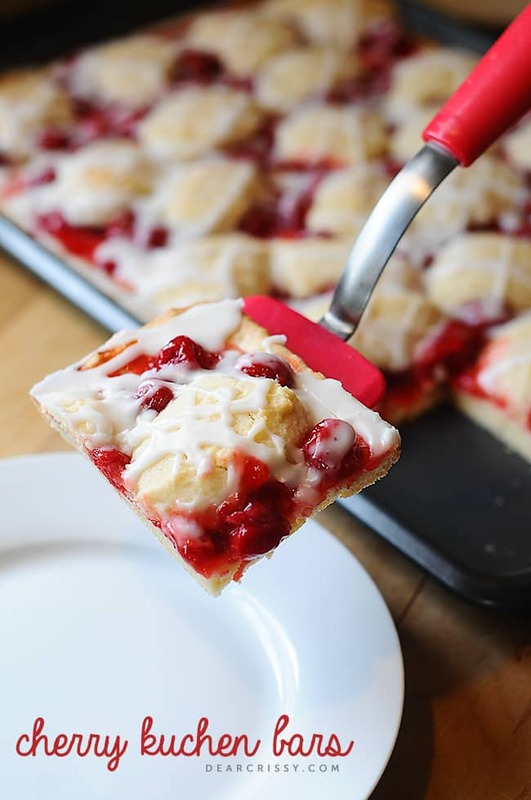 I grew to develop my own taste for cherry desserts, and this cherry kuchen bars recipe is absolutely at the top of my cherry sweets must-have list. Not only do these cherry kuchen bars taste heavenly, they are also drop dead gorgeous. Just… look. You know, there are times when you try a recipe from a magazine and the end result looks NOTHING like the oh-so-perfect photo on the printed page, but this was not one of times. Our version of the cherry kuchen bars looked every bit as beautiful as the magazine photos and that’s why I’m confident that yours will be picture-worthy, too. Actually, I think that’s one of my favorite things about these delicious bars—they look as impressive as they taste. If you want to serve a delicious dessert that will make your guests say WOW, these cherry kuchen bars are for you. The cherry kuchen (kuchen is the German word for cake, by the way) bars turned out moist and chewy with a little crisp around the edges. These cherry pie bars are sweet, but not too sweet. Honestly, I usually have to send these to work with my husband when I make them lest I eat half the pan while he’s at work and the kids are at school. I did want to note that while the recipe states a 32 bar yield, we did not get that many out of the pan. We ended up cutting much larger pieces and had only 24 bars. Of course, if you’re not a fan of cherries you could easily substitute your favorite pie filling. 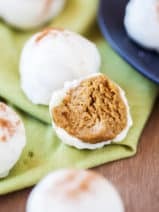 RELATED: Check out my easy apple pie bites made with crescent rolls and apple pie filling! I would also love to try this same recipe with blackberries. How beautiful would that be? 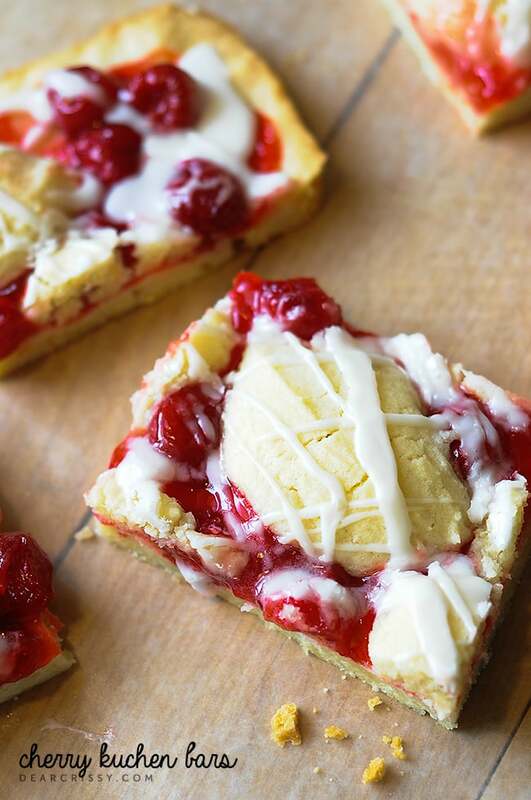 Be sure to grab the recipe for these outrageously good cherry kuchen bars below. Crazy About Dessert Bars? Try These! 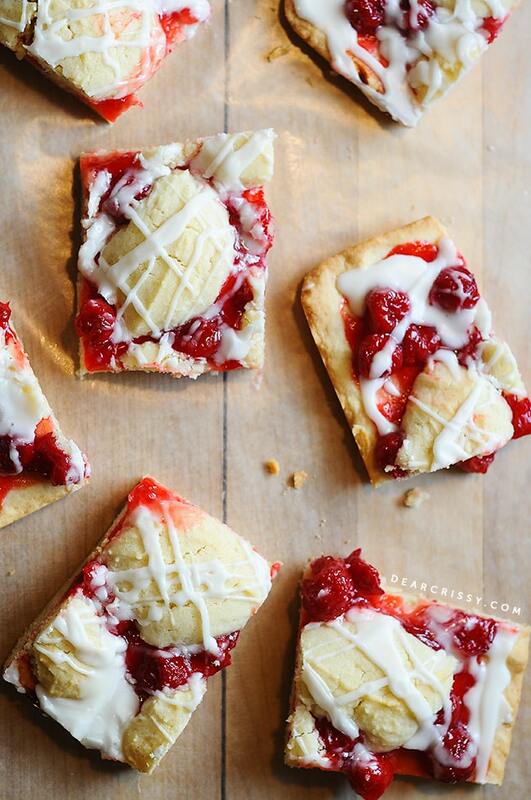 Looking for a dessert that’s easy to make but looks impressive? These gorgeous cherry pie bars are the ticket! Preheat oven to 350 degrees. In a large bowl beat butter and shortening with an electric mixer on medium speed for 30 seconds. Add sugar, baking powder and salt. Beat until combined, scraping side of bowl occasionally. Beat in eggs and vanilla until combined. Beat in as much of the flour as you can with the mixer. Using a wooden spoon, stir in any remaining flour. Reserve 1 ½ cups of the dough. Press the remaining dough on to the bottom of an ungreased 15x10x1-inch baking pan. Bake for 12 minutes. Remove, then spread pie filling over crust in pan. Spoon reserved dough into small mounds over pie filling. Bake an additional 30 minutes or until top is light brown. Cool in pan on a wire rack for 10 minutes. Drizzle with powdered sugar icing. Cut and serve. Slightly adapted from Better Homes & Gardens. I am making these for the second time for our weekly post church brunch. Everyone loves them! I split the fillings 1 can of each on the crust. First time I did apple and cherries, this time I am doing peaches and raspberry filling!Love the ease of this recipe! I just made these and WOW, they are delicious. My hubby and 2 boys (13&11) are loving them! Wow, this looks good (and I’m not a huge cherry person!). However, my husband and daughter love cherries so I’ll be pinning this for them. Visiting from Think Tank Thursday party. This is awesome! I love cherries and I would rather eat them, rather than any other fruit. Your bars are beautiful, and thank you so much for sharing them at Celebrate It! Oh my these looks super delicious. My kids don;t like cherries, so I may make them with apples instead. My husband and adult son both adore cherry pie so I make it for their birthdays and other times just for them. I’m not a huge fan of pie – I prefer cake. This looks like the perfect compromise. Your Cherry Kuchen Bars will be amazing! Hope you have a fantastic weekend and thanks so much for sharing with us at Full Plate Thursday. Those look delicious. I love cherries as well. Great pictures. A.m.a.z.i.n.g! Thanks for sharing at Brag About It. Pinned! They look amazing. I love cherry. We had kuchen last fall when we were in Switzerland. They had it everywhere. They sure love their desserts in Europe! :) I’ll have to give this one a try sometime. Stopping by from Wonderful Wednesday. Blessings to you! My husband loves cherry pie – I’m going to try making this for him! Omg! I would eat the whole pan of this yummines! They look amazing Crissy! Love it! Made these for my mom’s birthday, and a few other occasions–always a hit! This is such a great recipe. 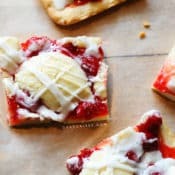 These are delicioso and everyone loved them at our church ladies meeting they literally disappeared and I am making it for the 4th of July!!!!! Served with vanilla ice cream of course !!! Thanks for the recipe !!!!!!??????????? 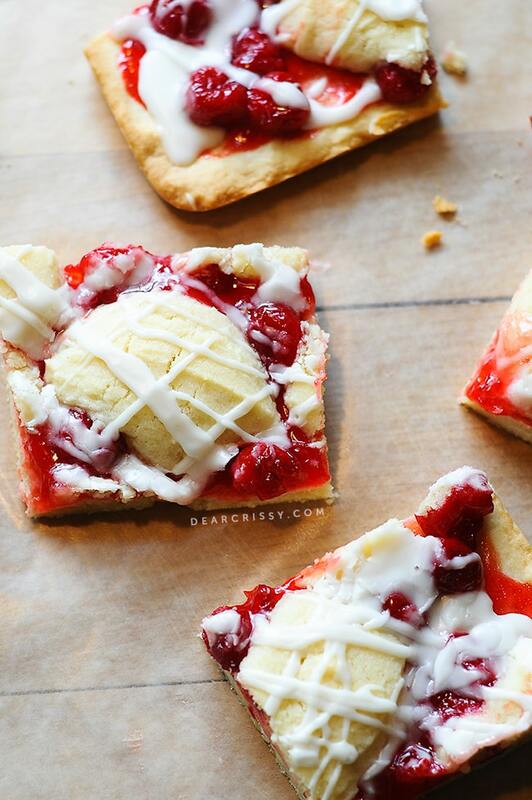 These are ridiculously delicious…like cherry pie with a shortbread crust. The delicate taste of almond makes for a fabulous combination of flavors. Can’t wait to try these! They look amazing! Beautiful pictures! Oh my! I made this as part of our breakfast, (yes I said breakfast) with some scrambled eggs. They were soooo delicious! Very much highly recommend. And I did the almond extract for my icing. Deliciously evil! 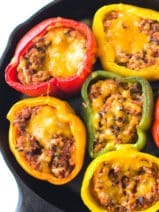 How can I email or send this recipe to my email? These are such a hit! Every one I make these for wants the recipe. Thank you!! 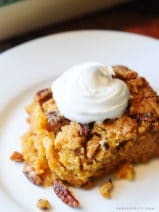 I grew up with my great aunts making kuchen and although this looks yummy, it is nothing like kuchen I learned to make. Ours starts with a sweet yeast dough, then a fruit layer (cherry, apple, peach, blueberry, pretty much anything) then is topped with a yummy sweet custard and baked. So delicious. Thanks for this recipe, it has inspired me to make some of my families kuchen! I made this recipe with apple pie filling instead of the cherry for Mother’s Day brunch – it was a hit! you designate and apprehensive, because the pan is not greased???????? Hoping you can answer right away now. I love these!! Thanks for sharing. I grease the pan, add almond to the mixture, cook for about 22 minutes after I put the filling on. Just made this recipe with my ‘made from scratch’ apple pie filling. It is delish and not too sweet. Thanks for sharing this great recipe! Is it one can of filling or two? I’m in the process of making these and it doesn’t seem like there’s enough cherry to cover the crust. I only used one and it did just fine for me, but my biggest pan was a 13×9. They turned out divine! 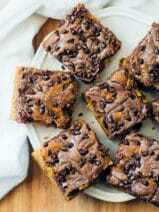 I used to make a bar similar to this one that was one of my go to recipes but sadly I lost the recipe several years ago. I would also make them with apple pie filling in the fall and sometimes blueberry. I can’t wait to give these a try. Gorgeous bars. I would definitely say that these are magazine-quality. So pretty with the bright red cherries peeking out! I’ll bet they taste even better than they look! I’m wondering how you got your glaze to be so white. My was clear. Did I add too much milk? I just made these…delish!! Unfortunately no pics, though! Do you know what the cook time would be if I used a 13 x 9 cake pan? We can’t find a 15 x 10 x 1 anywhere and we want to make these for Thanksgiving. I just made these in a 9×13″ pan, as I too did not have the 15×10″ pan. I baked them the first time as directed 12 minutes, then the last part 35 minutes. They do seem just slightly overdone and a bit dry, so next time I may just use the same time as written. And, needless to say, they are spectacular! I added some almond extract to the cake batter too, simply because I adore almond. This is a keeper and oh so pretty! Wow!! Those look delicious!!! Do you think there is anything that can be substituted for the shortening, since we generally don’t keep it in the house? We do keep lard. Do you think that would work? Those look AMAZING! I’m a huge fan of cherry pie and like to make little cherry pocket pies. I have to try your recipe! Gorgeous bars! And with that glaze? Perfection. Fantastic! They really are Gorgeous! They are a Must try! WOW they look amazing!!! Im actualy surprised by the simple list of ingredients and directions…I have to try this for the holidays im sure there will be plenty of compliments! This looks so Yum,yum,Yummy! Who doesn’t like cherries! !Thanks for sharing! Definitely printed this out. Thanks for the print feature.